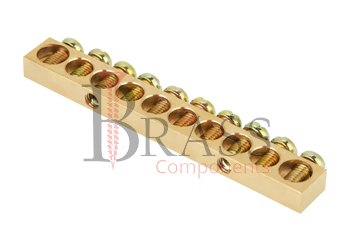 The wide range of Screw Terminal Blocks are manufactured from brass, copper, aluminium, stainless steel or any material composition as per custom specification. They are available with nickle plated, brass or tin plated head screws of any type. Screw Terminal Blocks are widely known as the industrial alternative for screw terminal strips. The standard range of Screw Terminal Blocks include horizontal, vertical or extended screw terminal blocks in different types. Screw Terminal blocks are available with different types of coating and plating include nickle plated brass, zinc, chrome plated, electric tin plated and more. Available with large surface area. Corrosion Resistance, Vibration Resistance and Abrasion Resistance. Special Tool require to tighten the Screw Terminal Blocks. Readily designed into products for circuit carrying currents. Allow replacement of wires or equipment. Provide highest degree of flexibility. Available in Multiway versions in the form of barrier strips. Ensure connection and quality with minimum electrical loses. Generally used for installation and termination. Widely used in building wiring for distribution of electricity. Provide protection to any type of wire connectors. For used in electrical, telecommunication, industrial controls, building, construction and other industries. We manufacture Screw Terminal Blocks as per Custom Specification and export in Germany, Sweden, Denmark, Norway, Russia, France and other European Countries. For more Information, Please Contact Us or Inquiry Now.